Marcel Camargo has made his living as a professional musician in different locations all over the world, working as a sideman to legendary Brazilian, jazz, and pop musicians such as Michael Bublé, Sérgio Mendes, Bebel Gilberto, and Gretchen Parlato. Stepping into the spotlight as a leader with The Brazil You Never Heard, Camargo has created a project to showcase his many musical facets - guitarist, vocalist, composer, arranger and producer. The São Paulo musician set out to produce an ongoing series of live concerts with companion studio records that feature his arrangements and compositions in the context of a chamber orchestra. While the focus is on Brazilian music, the repertoire embraces music from all over the world, illustrating how Brazil is both influenced by and influential to the international music scene. Behind Jobim, the first in the series of EPs, aims to take an abridged look into the mind of Antônio Carlos Jobim, arguably Brazil's most internationally renowned composer/songwriter. "When I put together the repertoire, I designed it to mostly feature music that I knew was influential to Jobim," says Camargo. "When I did include his compositions in the set, the idea was to tie those to other pieces by composers that were his heroes." The result is a historical narrative, pointing back to Jobim's favorite classical composers - Debussy, Chopin and Villa Lobos - as well as his predecessors in the legacy of great Brazilian composers - Pixinguinha, Garoto and Radamés Gnattali. When it came to recording the album, producing duties were split between drummer Leo Costa and Camargo. "For this EP, we chose to record pieces from the Behind Jobim concert that we felt made the biggest statements about what we wanted to accomplish musically and in terms of creating narratives," reflects Camargo. Those narratives are reinforced by the presence of vocalist Gretchen Parlato, who is no stranger to collaborations with Camargo. "Marcel Camargo is one of my favorite musicians, I love singing with him. He beautifully honors the classic sound we all adore in Brazilian music, but also allows his own voice to shine through...he's doing something very special and necessary with this project," says Parlato. The first historical connection is presented on "Lamentos do Morro," which Camargo imagined had a strong connection to Jobim's "Samba do Avião." The composition was re-orchestrated from a solo guitar arrangement by Brazilian guitarist Garoto to bring it closer to the hearts of non-guitar players. "I know Jobim loved Garoto as well and thought perhaps the song might have been of special importance to Jobim," reflects Camargo. On "Lamento," Camargo incorporates a modern take on the Choro written by one of the genre's most influential composers, Pixinguinha. Originally released in 1928, the tune was described by critic Cruz Cordero as an Americanization of the typical Brazilian style in both melody and rhythm. "We loved this piece and we think Jobim loved it too," states Camargo. "I thought I'd twist this Choro even further with some different harmonies and rhythms that, while still referencing the older style, make the tune seem modern." Vocalist Gretchen Parlato is featured on three of the album's five songs. On "I Fall in Love Too Easily," Parlato sings a duet with Camargo on guitar in an intimate setting. "We thought this was a nice contrast to the other tunes because of the sparse instrumentation and the improvised interpretation of the composition, whereas the other pieces on this record are very planned out and arranged," notes Camargo. "Prelude/How Insensitive" brings the classical connection to the forefront by using Chopin's "Prelude No. 4 in E minor (Opus 28)" as an introduction. It is transcribed for a string quartet and made to resolve into the arrangement of Jobim's "How Insensitive," which also features Parlato. Behind Jobim concludes with "Imagina," reinforcing the inspiration of Jobim and his ever-evolving connection to classical music. The song is said to have been Jobim's first composition from 1947, originally as a homework assignment from his teacher written for solo piano. Although the string quartet is the main sonic force, the harp and celeste are brought in to emphasize the dreamy quality of the arrangement enforced by vocals from Parlato and Camargo. "A big part of the success of the series lies in the caliber and uniqueness of the groups that I've been lucky to assemble to present the material," says Camargo. Often including string and horn sections with a core rhythm section as well as the harp and mandolin, these large chamber groups have the capability of bringing all the details of a given piece to life while opening the listener to musical moments that might have otherwise passed by unnoticed. Since the music of Jobim draws from many sources - mainly classical music, Brazilian popular and folk music, and jazz - Camargo creates a set that is very eclectic, yet conceptually cohesive. Born and raised in São Paulo, Brazil to a "musical extended family," Camargo learned to play guitar, percussion and sing with his uncle. At 16, he moved to the United States where he later earned his degree in Ethnomusicology from UCLA while studying under some of jazz' most significant musicians - Kenny Burrell, Billy Higgins, Harold Land, Gerald and Anthony Wilson as well as studying traditional Ghanaian music under master drummer Kobla Ladzekpo. His interests in school were varied but he was particularly attracted to folk music from different parts of the world. Taking full advantage of being in the United States, Camargo focused his studies on America's great folk idiom, jazz. Currently residing in Los Angeles, working both as a sideman and leading his own group, his main gig has been playing guitar and singing back-up vocals for international pop star Michael Bublé. His other side work has been diverse, ranging from working with Sérgio Mendes, Bebel Gilberto, Tom Harrell and Gretchen Parlato - to performing with R&B/Hip-Hop icons such as Seu Jorge, Flying Lotus, Talib Kweli and Pharoahe Monch as well as touring and recording with artists like Macy Gray, Quadron, and Missy Higgins. As an educator, Camargo has lectured on a variety of musical subjects while teaching at institutions such as the California State University Northridge, Shepherd University, the Larchmont Music Academy in New York, the French-American Lyceum Kennedy, and the South Pasadena Music Conservatory in California. 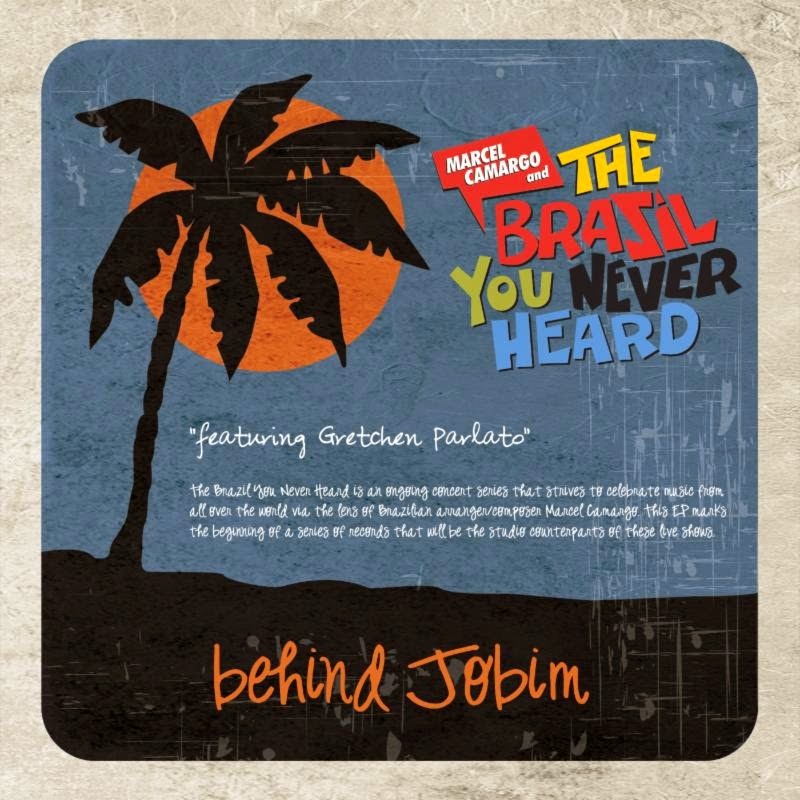 Marcel Camargo and The Brazil You Never Heard Behind Jobim is due for release on July 15, 2014.